What Else Can I Expect from a Paralegal Studies Program? What Can I Do With a Bachelor's in Paralegal Studies Degree? What Will I Learn in My Bachelor's in Paralegal Studies Program? Behind every successful law firm stands a team of hardworking paralegals. Paralegals and legal assistants operate behind the scenes in law offices, where they prepare paperwork, organize files, conduct research, and assist in other legal tasks. Although paralegals do not argue before the court, their tasks often overlap with those of a lawyer. 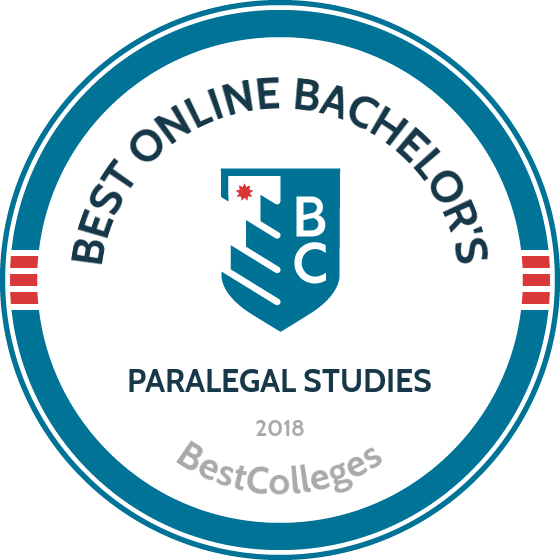 If you are interested in law, want to become a lawyer, or have a passion for fighting for justice, you may be a prime candidate for online paralegal programs. Career options for paralegals are growing. Between 2014 and 2024, the U.S. Bureau of Labor Statistics (BLS) expects an 8% increase in the number of paralegal jobs in the nation. The median income for a paralegal is about $50,000 annually, according to the BLS. Some career options only require an associate degree to become a paralegal, while many earn a bachelor's degree in paralegal studies online and work as a paralegal on their way to law school. Liberty’s BS in paralegal studies covers topics in various areas of law, as well as related subjects like contemporary perspectives, real estate, and rhetoric, through a Christian lens. Students in the paralegal bachelor degree online program graduate with a firm understanding of the U.S. Constitution, federal and state court systems, and civil and criminal legal processes. Course assignments provide hands-on learning opportunities, such as learning how to take and file a deposition. Graduates are also prepared to tackle complex tasks that require critical and analytical thinking, such as dealing with ethical dilemmas that are grounded in moral and biblical principles. Available courses include law of nonprofits, intellectual property law, and constitutional law. This 120-credit program requires that students complete at least 30 credits through Liberty. Students with professional or military experience may apply for prior-learning credit. MC was founded in 1826 and is the oldest institution of higher learning in Mississippi, as well as the second oldest Baptist college in the U.S. The school offers a variety of distance learning programs, including over 25 undergraduate and graduate programs along with six certificates. The school offers a 130-credit BS in paralegal studies that includes 27 hours of major coursework, beginning with an introduction to law. The curriculum also includes courses on foundational paralegal topics like civil litigation, wills and estates, family law, and legal research and writing. Coursework emphasizes written communication and prepares students to draft business letters, motions, pleadings, memoranda, contracts, and other deliverables. Applicants must submit official transcripts and ACT or SAT test scores to be considered. Brandman is located in Irvine, California and has offered high-quality degrees for working professionals and nontraditional students since 1958. Students at Brandman range from 18 to 65 and the school awards prior learning credits for life and professional experience as assessed through competency exams. Brandman offers a variety of fully online, hybrid, and self-paced online programs that allow students to balance work, life, and study. These programs include more than 30 bachelor's degrees covering over 40 areas of study, as well as a variety of certificates and authorization programs. Brandman offers a 45-credit bachelor's degree in paralegal studies that includes 11 core courses and four classes in the paralegal concentration. The curriculum includes courses on a variety of topics, such as contemporary legal issues, electronic discovery and legal technology, and law practice management. Students can also enroll in electives on topics like victim advocacy, employment law, and experiential learning. The program concludes with a legal studies capstone requirement. Graduates of FGCU's BS in legal studies program are prepared for paralegal and other related professions, including legal assisting. The curriculum provides an in-depth understanding of the legal system, including courts, clients, and lawyers' ethical duties. Students are exposed to many practice areas of law, including trusts and estates, family law, and international law. Distance learners access courses through the Canvas Learning Management System. In addition to general education courses, students in FGCU's online paralegal degree program complete 48 upper-level courses. Students who enter with a qualifying associate degree may immediately begin study in upper-level coursework. All paralegal students at FGCU must complete service-learning and foreign language requirements as part of their bachelor’s degree. Pierce is a community college that was founded in 1967 in Puyallup, Washington. In 2017, the school won the Achieving the Dream's Leah Meyer Austin award for excellence — a first for any West coast community college. Pierce serves more than 20,000 students each year, nearly one quarter of whom are distance learners. The institution offers 40 undergraduate degrees, along with 44 professionals certificates. In total, students can study in over 65 different areas. Online courses are delivered asynchronously, allowing students to complete coursework at their own pace. Pierce offers an online bachelor's degree in paralegal studies that is approved by the ABA. This 121-credit program includes 51 credits of core courses on topics like civil litigation, professional legal responsibility, contract law, and real estate law. Graduates are prepared to pursue careers in law firms, corporate offices, or the government. Students who already hold a degree may consider the paralegal studies certificate, a 31-credit program that is also available online. NSU was founded in 1884 as a teacher's college. In 1944, NSU became a four-year college and in 1970 became a public university. To accommodate as many students as possible, NSU offers accelerated eight-week sessions during the spring and fall, allowing students to enroll in only one or two courses at a time and still graduate on time. eNSU, the university's university's global online campus, offers over 50 degree programs and certificates to choose from. NSU's Department of Criminal Justice, History, and Social Sciences offers a pre-law and paralegal studies concentration within the BA degree in criminal justice. The purpose of this concentration is to establish a pre-law focus of study in an online forum. The concentration splits between 15 credits of concentration classes and six additional credits of paralegal or law electives; students in NSU's resource management program may also complete this concentration. NSU also offers a pre-law and paralegal studies minor, as well as a certificate program. Online courses are delivered asynchronously and no campus visits are required. All online students pay the same tuition rate, regardless of residency. UMass Lowell is a public research university in Lowell, Massachusetts, that serves more than 17,000 students each year. The school boasts over 100 majors, 40 master's programs, and 30 doctoral degrees. UMass Lowell offers a wide variety of distance learning courses through its online campus, including more than 50 degrees and certificates. The school offers a BS in criminal justice with an option in paralegal studies which covers the same ground as a bachelor of science in paralegal studies. This 120-credit program requires students to enroll in six paralegal courses that introduce the basics of the field, including legal concepts and business law. The curriculum also includes courses on the relationship of law, logic, and ethics. Graduates possess a firm understanding of litigation, legal research, and evidence and discovery. Tulane was founded in 1834 in New Orleans, Louisiana, as the Medical College of Louisiana. Today, the university is a member of the Associate of American universities, an exclusive 62-member research consortium. Tulane also offers a wide variety of distance learning programs, including 1,700 classes and 75 majors, with over 60% of students enrolling in online courses of some kind. SoPA, the School of Professional Advancement, emphasizes the educational needs of working students. Tulane offers a paralegal bachelor's degree in the form of a BA in general legal studies with a certificate in paralegal studies. This 120-credit program includes 36 credits of major coursework on topics like court systems, legal concepts, and legal practices. This program emphasizes communication and clarity in writing and case research. Graduates are prepared to pursue careers as paralegals, human resource managers, court clerks, and contract administrators. EKU is a public university that was founded in 1906 in Richmond, Kentucky. Today, the school offers 40 online programs at the undergraduate and graduate levels, as well as certificates and other credentials. EKU offers 14 online bachelor's degree options, including a 120-credit paralegal studies bachelor's degree that can be completed 90% online. The residency requirement requires students to earn a minimum of 10 credits through traditional classroom instruction. The curriculum includes courses on a variety of topics, such as legal research and writing, litigation, and computer programs. Students also enroll in courses on family law, probate, and criminal law. Applicants must have a minimum high school GPA of 2.5 and qualifying standardized test scores to be considered. Transfer students must have a minimum GPA of 2.0 in all transferred courses. All online students pay the same tuition rate, regardless of residency. EKU's paralegal program is a charter member of the American Association for Paralegal Education. COSC is a public college that was founded in 1973 in New Britain, Connecticut, with the goal of serving nontraditional students. COSC is a member of the Constitution State's system of public higher education, which includes four state universities and 12 community colleges. The school offers a bachelor's paralegal program as a general studies degree with a concentration in paralegal studies. This program includes 36 credits of major courses split between eight core courses and four electives. Core courses cover topics like business law, legal ethics, technology, communication, and civil procedures. COSC awards prior learning credit for academic, professional, and life experience as assessed through testing, certification, or military training. Online courses are delivered in five-, eight, and 15-week formats and students may transfer up to 87 credits from another institution towards their degree. Admissions is on a rolling basis, with applications reviewed once submitted. Applicants must submit official transcripts and standardized test scores to be considered. Keiser has 18 campuses in Florida and serves more than 20,000 students each year. The Fort Lauderdale campus offers both online and on-campus programs in business, criminal justice, education, IT, healthcare, and the legal studies. Keiser offers a bachelor's degree in paralegal studies online program that prepares students for careers in law and law-related fields, including the corporate setting, the government, or criminal justice. This 120-credit program includes 70 credits of coursework in paralegal studies topics, split between six lower-division and 12 upper-division classes. Graduates possess a firm grasp on written and verbal communication, demonstrate strong critical thinking and analytical skills, and have a sound understanding of U.S. law. Application requirements include an unweighted 2.8 high school GPA, a minimum SAT score of 1580 or ACT score of 22, and two letters of recommendations. Transfer students must have a minimum GPA of 2.0 for any transferred college coursework. Kent State was founded in 1910 as a teacher's college. Today, the school has expanded to an eight-campus system that serves more than 39,000 students each year. The school offers a variety of distance learning programs, including a bachelor's degree in paralegal studies. This program combines liberal education requirements with specialized study of the paralegal field. This 121-credit program includes 42 credits of major coursework on topics such as principles and practice of litigation, family law, labor law, and employment law. Six credits of internships are required, though students may enroll in the course for up to 12 credits. Transfer credits are permitted on a conditional basis, based on the accreditation status of the institution and the comparability of the courses. Hodges University was founded in 1990 in Naples, Florida, as International College. The school offers a variety of associate, bachelor's, and master's degrees and serves students of all ages and at all stages of their academic or professional careers. The average student is 32 years old. Hodges offers a variety of distance learning programs, including a paralegal bachelor's degree that prepares students for careers in either business or a legal setting. The program emphasizes skills in legal research, evidence collection, communications, and litigation preparation. This 120-credit includes 48 credits of legal courses, 32 credits of liberal arts requirements, and 40 credits of electives. All courses are delivered asynchronously online, allowing students to complete coursework at their own pace. Courses also emphasize the emerging area of electronic litigation, which is concerned with the legal issues surrounding electronic data, filing, and litigation. In the legal component, students explore civil procedure, torts, contracts, property, and constitutional law. With its main campus in Fulton, Missouri, WWU also delivers degrees at locations throughout the state as well as online. The university’s BS in paralegal studies program, approved by the AAfPE, offers students the knowledge and skill sets necessary to succeed in the paralegal profession and functions as a foundation for further study in law school. The curriculum for WWU's paralegal bachelor degree online program covers the American legal system, legal research and writing, interviewing and investigation skills, substantive and procedural law, and more. Students in the program complete 42 credits in a 14-course sequence. As part of a required practicum experience, students participate in hands-on paralegal work through the program’s virtual law office. Six program start dates throughout the year allow students to begin the program at a time that fits their schedule. Courses are structured in eight-week terms and offer start-and-stop flexibility. WWU integrates a service-learning model into all of its programs, encouraging disciplined and passionate commitment to hands-on experiences. Graduates of WWU's paralegal program work in government, law firms, and other industries around the world. The Bureau of Labor Statistics reports the average paralegal salary as $48,810 per year. UMUC is an online college located in Adelphi, Maryland, that specializes in serving working professionals and nontraditional students. The school has 20 locations throughout Washington D.C., Maryland, and Virginia, and offers over 90 degrees, specializations, and certifications. The 120-credit bachelor of science in paralegal studies teaches students with the skills needed to thrive in legal environments, such as how to produce and review legal forms, apply statutes to legal cases, and assess fact patterns. The curriculum includes 11 major courses that examine the organization, function, and processes of the law-making institutions in the U.S. legal system. Learning outcomes include the ability to conduct research by using appropriate resources to identify relevant, current legal authority and draft documents that reflect critical thinking and legal reasoning. UMUC uses an achievement-based admission system, and applicants are not required to submit standardized test scores. Transfer students who have earned more than 24 credits of coursework may forgo submitting high school or GED information. Transfer applicants may apply up to 90 credits towards their degree. VSU is a public university that was founded in 1913 as a normal college for women. Today, the school is a part of the University System of Georgia and serves more than 10,500 students each year. VSU emphasizes distance education in large part due to its partnerships with community colleges and the military. VSU offers a 120-credit paralegal bachelor's degree that prepares students for careers as legal assistants who can assist with research, document preparation, and other important matters and who can work in a variety of legal settings. In addition to learning how to carry out legal research, students also learn how to identify and act upon ethical dilemmas. Graduates are equipped with a solid understanding of the American legal system. Applicants must submit official high school transcripts and SAT or ACT scores to be considered. Students can earn their degree in four years of full-time study. Saint Mary-of-the-Woods College offers one of the best online paralegal programs available today. Graduates are prepared to fulfill many of the same duties as practicing lawyers, including performing legal research, organizing materials for cases, drafting legal documents, and communicating effectively with clients and partners. This 47-credit BA in paralegal studies program emphasizes law in a political, societal, and historical context, and is built on a foundation of liberal arts studies. Students may choose to follow a personal law or litigation track, and a variety of electives provide exposure to other practice areas like environmental law and criminal law. Highly motivated students can also participate in an optional independent study or internship, or the school's mentor program, which provides legal experience in real-world settings. More than 90% of Saint Mary-of-the-Woods’ graduates are hired into a related career soon after graduation. SUNY Canton was founded in 1906 and has been a member of the State University of New York Systems since 1987. The school serves more than 3,200 students each year and boasts a 17-to-1 student-to-faculty ratio. This four-year college of technology offers over 45 undergraduate degrees, five professional one-year certificate programs, and 13 distance learning programs. The paralegal studies bachelor's degree teaches students how to conduct legal research, produce legal writing, and understand the various areas of law, including business law, civil litigation, criminal practice, family law, constitutional law, negligence, intentional torts, and trusts and estates. For example, the course in legal writing explores explores how to create legal documents, such as client letters, memoranda of law, and pleadings. The curriculum also includes an internship requirement, allowing students to process case examples and studies in a real legal office. The internship takes place during the final semester and can count for the final 15 credits of the program. Hampton's four-year BA in paralegal studies program is designed both for students who are looking to enter the legal field for the first time and for practicing paralegal professionals. As with other paralegal programs online, the curriculum combines specialized legal training with a liberal arts foundation. Students gain basic knowledge of several areas of law, including personal injury, real estate, and litigation. Additionally, students have the opportunity to participate in hands-on internships. Graduates leave with enhanced skills in writing, analytical thinking, and academic research, and are prepared to fulfill legal roles in various organizations, including government agencies, banks, and corporations. Program application requirements include a high school diploma or GED, an essay, and an GPA of 2.0 or better. Veterans and active-duty service members with at least two years of honorable service may also be eligible for academic credit towards the program. Loyola was founded in 1870 as St. Ignatius College. Today, it is one of the nation's largest Jesuit universities with more than 16,500 students across 13 schools, colleges, and institutions. Loyola offers a variety of distance learning programs, including a 120-credit bachelor in paralegal studies program that includes 48 credits of major coursework. The curriculum includes courses that explore American law, legal research and writing, legal ethics, and law office computer applications. Students can choose one of three practice tracks: litigation, corporate practice, or combined litigation and corporate practice, which takes two additional courses. Students can apply up to 24 transfer credits towards their degree and can begin their study during any of the five academic terms throughout the year. Applicants must have a minimum GPA of 2.0 and hold an AAS in paralegal studies or a minimum of 15 credits in paralegal coursework to be considered. Paralegal/Legal Assistant: Paralegals or legal assistants work in private law firms, public law offices, government departments, corporate law divisions, and nonprofit law establishments. Although they cannot argue in court or offer legal advice, many of their tasks overlap with those of lawyers. Professionals in this field prepare legal documents, file records, and perform administrative work. Claims Adjuster: Often working with claims appraisers, examiners, or investigators, claims adjusters research and investigate insurance claims. An adjuster is tasked with investigating a specific claim and resolving claim payment responsibility. From medical to automotive, claims adjustors usually work for private insurers, and a legal background is useful for understanding risk and uncovering fault. Law Clerk: A judicial law clerk works for a federal, state, or municipal court or judge. Clerks are tasked with research and legal document preparation for the court in the same way a paralegal is for a law office. Other administrative clerk jobs in government or private offices may be attractive to paralegal degree holders. These jobs may include record keeping, research, and data collection. Title Examiner: Title examiners work with legal records. Benefiting from both public and private career opportunities, title examiners compile lists of contracts, real estate transactions, insurance paperwork, or automobile sales. Title examiners may be required to authenticate a record or prepare legal summaries for lawyers. Title examiners work for law offices, government agencies, insurance companies, and real estate firms. Although paralegal programs online may consist of a range of curricula, most include the same core class options. Topics students can expect to encounter when enrolled in the best online paralegal programs include legal investigation and communication, legal ethics, civil law, criminal law, real estate law, and insurance law. Legal Research and Communication: Courses in investigation, research, communication, or compositions may appear under various names at different institutions, but these courses make up the core of any online paralegal degree program. To prepare for a successful career as a paralegal, students must learn the terminology, methods, and style of drafting legal briefs and motions. Legal Ethics: A paralegal may not have all of the abilities a lawyer has, but he or she has the same ethical responsibilities. From securely managing documents and data to maintaining client privacy, paralegals learn the do's and don'ts of legal ethics early on in their classload. Civil and Criminal Law: Split into two classes on legal studies or more, paralegals learn about the two largest divisions of America's criminal justice system. Whether you end up working for the DA or a private small claims lawyer, either criminal or civil law may become more important to your career, but both are important foundations for any online paralegal degree program. Real Estate Law: Outside of law offices, courts and government departments, real estate business and insurers are the businesses most in need of paralegal degree holders. As a student of real estate law, you can learn about the requirements of home owners, real estate firms, and intricacies of contract law and trusts. Insurance or Business Law: Similar to real estate law, paralegal students learn about other industries known for litigiousness including business and insurance. Corporate law and insurance claims adjusters are popular landing spots for paralegal graduates. It's worth paying attention to these in-depth legal studies courses. The range of salaries that bachelor's degree holders can expect depends largely on job title, sector, and experience. An entry level legal assistant or paralegal salary is lower than others on average. The median income for these positions is skewed lower due to so many employees working with only a few years of experience. But even with little experience, career opportunities in the corporate sector or a senior level paralegal career track can offer much higher salaries. Other career options for paralegal graduates, such as claims adjuster or law clerk, offer better salaries for professionals with more experience. Unlike becoming a nurse or teacher, your path to becoming a paralegal does not require state-mandated certification. However, there are some certification opportunities that can help when seeking positions with specific employers or within specific sectors. Additionally, other career options that you can pursue with a bachelor's degree, such as becoming a public claims adjuster, may require certification. Certified Legal Assistant or Certified Paralegal - CLA or CP certification is awarded by the National Association of Legal Assistants, Inc. After completing your degree, you can attempt the two-day NALA awards CLA or CP designation test to prove your proficiency. Professional Paralegal - The National Association for Legal Secretaries awards certifications for paralegals and other law office employees, including the PP. Paralegals must hold a bachelor's degree and have four years of experience before attempting the PP. Paralegal Advanced Competency Examination - Awarded by the the National Federation of Paralegal Associations, Inc., the PACE and the Registered Paralegal “RP” proves competency and includes state-specific requirements. Paralegals and legal assistants benefit from professional organizations that allow for job support, networking, and annual conferences. Available to long-time paralegals and recent grads alike, these associations assist professionals in finding new job opportunities, provide educational resources, and facilitate social interaction with fellow professionals. The National Association of Legal Assistants - With an emphasis on professional education, NALA and its many members can help you stay at the forefront of the paralegal world. The National Federation of Paralegal Associations - The NFPA a foundational paralegal organization that every professional in the field should know. This organization administers the PACE exam along with many publication and events relevant to the field. The American Bar Association - The top organization for American lawyers is also critical for paralegals. With more than 400,000 members, the ABA allows paralegals to tap into the mainstream legal sector for networking and continuing education. The prospect of paying for your paralegal degree online can be daunting, but there are many tools and opportunities designed to help you navigate this process. Fill out your FAFSA and contact your program's financial aid office to discover what scholarships, grants, loans, and need-based aid are available to you. Some students may be eligible for work-study or other need-based opportunities, and schools often offer merit-based awards as well. Private grants or scholarships specifically for paralegal studies students may also be available.